For most of us, traveling to Disney is a big event and usually involves a lengthy flight or car ride. Making sure we’ve packed everything we need, want, or may wish we had can be a little nerve racking. In this post, I’ll share some tips for packing and what to think about when you’re making your list (yes, you should absolutely make a list!). It’s important to have a packing list for every trip you take, but there’s a lot more to think about when that trip is to Disney World. This luggage is absolutely amazing!! SO cute, great sizes, and the wheels are spinners! You can find the large (28″) one here and the small (21″) one here! Oh, and the luggage tags are also American Tourister and I snagged them on Amazon. The single most important tip I can give you for packing is to make a list! There are so many things to think about and you will not remember them all if you keep it in your head. I start my lists probably obsessively early, but doing so gives me the chance to remember, forget, and remember again as I add things to the list. The weeks leading up to a trip are always so exciting and I’m constantly thinking of some random item at the most bizarre times. I keep my list on my phone so I can add to it at any time. Plan your outfits. Make sure you’ve allotted accessories for each day. If you have multiple pairs of mouse ears, like I do (check out my collection here), you’ll want to plan ears with your outfits, too. If your hair is long enough to put in a ponytail, bring way more hair elastics than you think you’ll need in case one breaks. I always overpack on socks and underwear, too. They don’t take up a ton of room and I’d rather have too much than not enough. I also check the average weather for when I’m going and in the weeks leading up to my trip and may bring changes of clothes for early in the morning and in the evenings if it has the chance to get cooler. I always always always bring a mix of sleeveless shirts, short sleeve shirts, a long sleeved shirt, and a sweatshirt or 2. Florida gets HOT, but check the weather for the time of year you’re going because it can also get surprisingly cool in the winter months and you want to be prepared. There’s nothing wrong with having a great excuse to buy some Disney clothing, but you don’t want to be forced into it if you didn’t allot for it in your budget. Perfect t-shirt and sweatshirt combo to be prepared for any weather! Shirt & button from Cafe Forty Seven, earrings from Arribas Brothers in Disney World (these are unfortunately no longer available, but they’re always making something new and beautiful), popover from Pretty Little Monograms, 3D castle ears from Aloha Ears Design, phone case from Amazon, bracelets from Mikaylove, and hair clip from The Marrymaking Mouse. We like to try to save some money on food and bring granola bars and cereal with us. We’ll bring reusable plastic bowls in our suitcases so we don’t have to buy breakfast. Once we arrive at the resort, we snag some plastic spoons from the food court and buy a bottle of milk to keep in the fridge. Every morning, we just wash the bowls, spoons, and our refillable mugs in the bathroom sink in our room and leave them to dry all day. It’s a great way to save some cash and it usually means extra room in the suitcases for souvenirs on the way home since that box of cereal is gone. If you aren’t picky about what you use, don’t pack a hair dryer, shampoo, conditioner, or soap. Pretty much every hotel anywhere provides those items now and the ones at the Disney resorts are pretty good and they smell great. Plus, who doesn’t love soap with Mickey on it?? In Florida, sudden rainstorms are pretty common. They often are extremely short but they’re still wet! I always bring a pack-n-go rain jacket or rain poncho with me (I just ordered this jacket in black with the Ears/Bows monogram in 2 shades of pink!). Ponchos are way cheaper from a big box store or drug store at home than they will be in the parks and you don’t want to let a little rain dampen (get it?? 😉 ) your trip. In that same vein, we always pack lots of ziplock bags. I use large gallon sized bags for any toiletry items we do bring since we usually pack them in the suitcases and I don’t want toothpaste all over my clothes. More bags are for those small carry-on liquids, but I bring even more than that. We bring them for wallets and phones for days rain is predicted or for Kali River Rapids and Splash Mountain, so nothing important gets ruined. I like to keep extra empty bags in the backpack we carry around the park, too. They’re great for holding pressed pennies or other small souvenir items and even for throwing the last few bites of a meal into. They take up less room than takeout containers and are more eco-friendly. If you know you’ll be headed back to the room soon or think you’ll be hungry again in an hour or two, it’s great when you don’t have to waste that uneaten food. These Adidas Neo Lite Racers are so lightweight and comfy and they’re available on Amazon! Sneakers. Bring them. Wear them. Your feet (and whole body) will thank you. If you’re flying, I recommend wearing your sneakers (or whatever largest pair of shoes you’re bringing) so there’s more room in your suitcase. Plus, in case you need to run through the airport for any reason, you’ll be better equipped to do so. I suggest bringing more than one pair of shoes for daily wear. You will walk A LOT while you’re in the parks and your feet may get tired of the same pair of shoes everyday. You may also find you develop blisters, even with shoes that are well broken in, just from the sheer amount of walking. If you do have sneakers in your suitcase, stuff as many pairs of socks in them as possible to save space, too. The shoes are taking up room in there, anyway, so you may as well make the most of it. Last, and probably most important, make sure there is extra room in your suitcases and/or carry-on bags when you leave home. You will absolutely buy souvenirs while you’re there and you’ll want to be sure you can get them all home! If you stay on Disney property and make purchases in the parks, at other resorts, or at Disney Springs, you can have the item sent back to your hotel’s gift shop so you don’t need to carry things around with you (they will not do this within the last day or 2 of your trip to ensure the items get to you before you leave). If they’re breakable, Disney cast members do a phenomenal job of wrapping everything up nice and safe for you, too, but they will take up more space in your luggage that way, so plan accordingly. We had to wrap all these up SO carefully to bring them home! @mr_theme_park_junkie Ziplock bags! Pack them in your pockets if you aren’t bringing a backpack or purse. If it rains or you decide to go on a water ride, put your wallet, phone, etc. into the bag and you’re good to go! @adshine16 If there’s rain in the forecast I bring my own poncho … I download an app that can be played with people waiting in line with to make the time go faster. @delock13 A battery pack! I’m constantly on my phone checking the disney app and taking pictures. And I’m bringing an insulated backpack this year so that we can bring our own snacks and water bottles. @llikotdesserd Not a disney tip, but theme parks in general- tylenol, benadryl, and acid reflux meds! … you never know when that headache/allergic reaction / or unfamiliar food will catch up with you and start to prevent you from enjoying yourself! Also- sunglass straps … for keeping our sunglasses on on roller coasters! 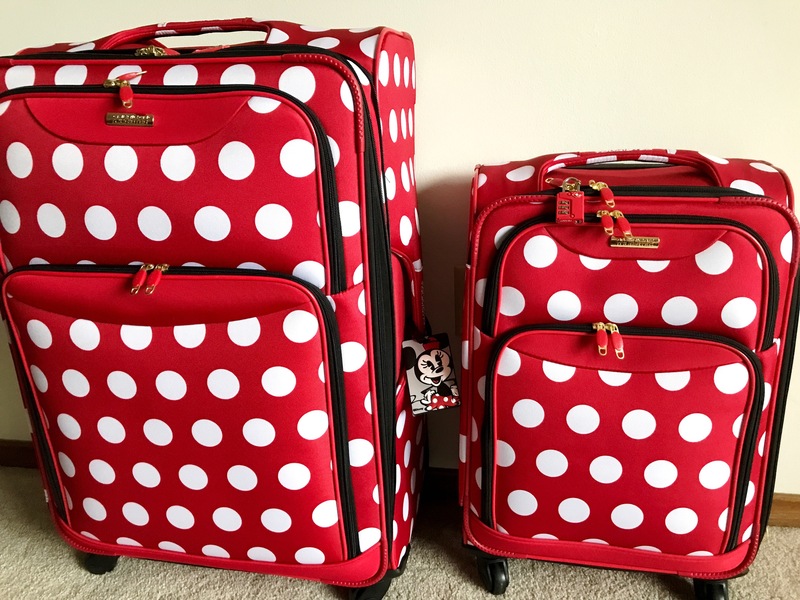 Let me know in the comments what some of your must-pack items for Disney are! A reusable water bottle!! You can ask for a cup of ice water at any of the quick-grab/permenant food stands and pour it into your water bottle to avoid spills.